Searching for the right job candidate can be a long process. As a hiring manager, one of your primary goals is to find the best-qualified talent in the least amount of time while maintaining company budgets along the way. This can sometimes feel like an impossible task, especially when sourcing new qualified candidates in the IT industry. It’s necessary for hiring managers to recognize some of the hurdles in place for newly acquired IT staff. 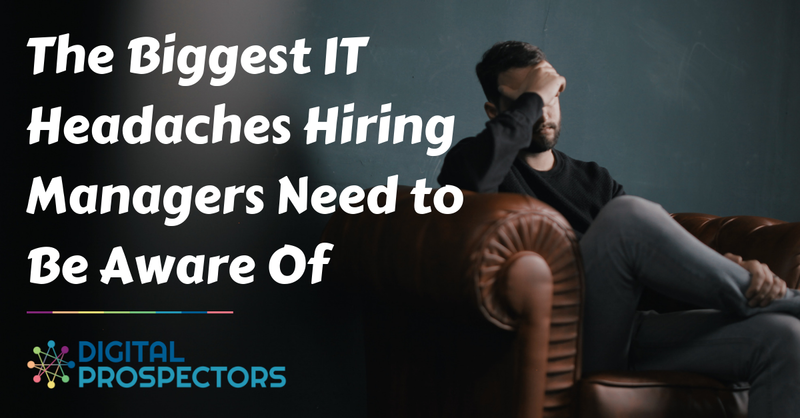 By understanding some of the largest headaches in the IT industry, you’ll be better equipped to make the right hiring decision the first time and reduce your employee turnover rates. Today’s IT landscape is incredibly dynamic, and while job positions continue to appear, it can be harder and harder to fill them correctly. Cybersecurity is an international issue that all companies need to face, and unfortunately, there aren’t enough workers with skills in this field to hire. Companies and their hiring managers should reevaluate the immediate needs of the organization and recognize that it’s just not possible to check every box in the IT skill set checklist. Finding a balance of essential in-house staff requirements and job functions that can be outsourced will help pave a more realistic outlook of your hiring needs. In 2018, many IT professionals complain about inadequate training at their place of employment. This is because many organizations feel it’s the IT staff member’s responsibility to stay up to date on newer technologies on their own time. Providing opportunities for training and development can go a long way in keeping newly acquired staff motivated to stick around for the long haul. What’s even more, untrained IT staff members can be extremely detrimental to your organization and cause many operational issues down the road. While outsourcing has become a popular trend in IT, there are concerns in reliability and security that should be considered. Quality control is always an issue when working with third-party IT providers and other business solutions. Along with this consideration, outsourcing can open up a variety of security threats from shady sources or untrained staff members. Companies are wise to adequately vet all outside parties when employing them to take over core aspects of the business. While hiring in-house teams can sometimes be more costly, it can be beneficial to have as much visibility over IT best practices as possible. Taking the time to understand roadblocks in the IT industry can help you dramatically when sourcing new job candidates. By recognizing these critical issues early, you can be better prepared to tackle any problems that arise while reducing your employee turnover rates. For more information, connect with one of our IT staffing specialists today!